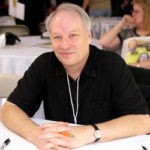 He’s the author of over thirty novels and numerous short stories, which have won him a coveted Edgar Award, A SPUR AWARD, TEN Bram Stoker Awards and a lifetime achievement award, the Horror Writers Association Lifetime Achievement Award, as well as the Herodotus Historical Fiction Award, and the Inkpot Award for Contributions to Science Fiction and Fantasy. His work has appeared in national anthologies, magazines, and collections, including numerous foreign publications. Not only does he have a large volume of novels in print, he’s also written for comics, television, and film. Hap Collins and Leonard Pine appear to be an unlikely couple, but they’ve kept today’s guest busy for nearly 30 years. Welcome to the wide-open, full-throttle world of Joe R. Lansdale. in the image below to listen to this episode. Listen to “JOE R LANSDALE – PDI-2018 Adventure #26” on Spreaker.